Who owns the World Cup? The case for and against (intellectual) property rights in sports. 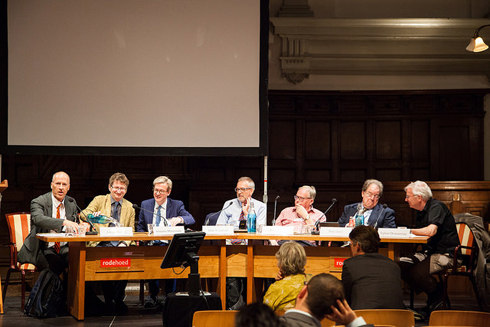 During the recent 25th anniversary conference of the IViR (2-4 July in Amsterdam) many interesting lectures were given and many intriguing panel discussions were held. In the unfortunate case you missed the conference, you can find several fotos and videos of the event on the webpage of the conference and on IViR’s YouTube channel. Readers of this blog already know that the last day of the conference, just after the splendid closing keynote by James Boyle, a panel was dedicated to an event very high in (almost) everybody’s minds, at least at that time – the 4th of July was the day of the FIFA World Cup quarter finals. The title of the panel was “Who owns the world cup? The case for and against property rights in sports events”, and it can be finally seen on IViR’s YouTube channel as FAPL has very kindly released the block for copyright infringement after IViR disputed the claim (see here for the details). The panel was aimed to discuss the private/public nature and the cultural/social/economic function of sports in modern societies and the consequent optimal level of legal protection. While much of the debate can be extended to any other kind of sport, the panel focused on football not only due to the concomitant World Cup, but also due to its major relevance in terms of diffusion, commercial exploitation, and social impact. Sport attracts enormous financial interests in terms of ticket sales, media rights and sponsorships. It is reported that an aggregate of 36 billion people (or 3.2 billion unique viewers) watched, at least in part, the 2014 FIFA World Cup. The exclusivity sought by sports organizers to increase the media value of this and similar events is usually found in property and intellectual property laws and is further negotiated through contracts (see the IViR’s study on sports organizers’ rights in the EU for a detailed analysis). Nonetheless, sport cannot be reduced to its economic dimension only. On the contrary, sport is also, or mainly some would argue, an important socially relevant activity due to the educational function it upholds, particularly for the youth. The type of sport that is more strictly linked to this social dimension (usually grass-root and/or amateur sport) is generally and largely publicly funded – although it also receives funds from its professional relatives – and would not survive on the basis of its own capacity to generate revenues. From this point of view, the model of State “patronage” has been quite successful for the development of sport, without the need to create additional property rights, and possibly irrespective of those already available. A second important public function of sport is linked to access to information. In the EU, important football events such as the World Cup (at least the final phase) are considered “events of major importance for society” and must be broadcast on free-to-air TV. In this way the public interest goal to grant society access to such information is achieved. This is in addition to the short news reporting that gives access to the signal of exclusive broadcasters, therewith favouring media pluralism. The resulting picture appears contradictory, or perhaps is just complex given the complex nature of sport. On the one hand it constitutes an extremely profitable business for the private sector and thrives in the market. On the other hand, it is sufficiently socially relevant to deserve state subsidies (from grass-root financing to tax benefits for professional teams), suggesting that perhaps market dynamics are not working sufficiently well. Finally, sport’s public interest dimension is so relevant that the public has a right to view major events on free-to-air TV, reducing of course the potential economic value of related media rights. This complexity causes strong tensions between the different stake holders and the “players of the game”: sport organizers, clubs, federation, players, broadcasters, the media, sponsors, and fans. The question is: Who owns the world cup? The panel, moderated by IViR’s director prof. Bernt Hugenholtz, asked three experts in the field of intellectual property and information law and a fourth from the social theory of sport to answer this questionand to discuss the role of (intellectual) property rights in sport. Additionally, two commentators, leading experts in the field of intellectual property and information law, were asked to comment briefly on the relevant issues. The first talk was given by prof. Lionel Bently and focused on the recent ECJ decision in FAPL (Case C-403/08, 2011). The Court denied EU copyright law protection to sporting events, and in particular to football matches as such. The main argument of the ruling regards the lack of free creative choices and personal touch, the current test of copyrightability at the EU level. Football matches must follow rules of the game in order to be played, and these rules leave no space for free creative choices, hence no copyright protection is available under EU law. Examples of great skills in the act of playing the noble sport of football were provided for the amusement of the audience (videos of actions, goals, passes, stops), but then the hard question emerged: how to distinguish between skill – which, for how elaborate it can get, is not enough to grant copyright protection (see Football Dataco v. Yahoo) and creativity? Moreover, if we were to recognize copyright protection for sport events such as football, a number of other questions would arise, chiefly that of authorship. Who is the author? The player executing the trick, all the players involved in an action as joint authors, or the coach as the director of players’ performance? The second intervention, by prof. Graeme Dinwoodie, focused on trade mark law and the reliance of sports organizers on this tool – sometimes even beyond its inner limits . On the basis of FIFA’s intellectual property policy, three grounds that justify strong investments in brand protection can be regarded as crucial,: the protection of the brand, the guarantee of a positive fan experience, and the protection of sponsors’ rights. It is crucial – FIFA holds – that sports organizers develop a strong brand that “captures the essence of both the World Cup and the host country” and creates “a sound emotional link between FIFA and the fans all over the world”. As a result, the positive fan experience of attending the World Cup is ensured. Fans – argues FIFA – will not be targeted by prohibited marketing activities such as the omnipresent menace of ambush marketing. Non-authorized companies, in fact, try to exploit fans’ enthusiasm for their commercial advantage without bearing the relative costs, frustrating in this way FIFA’s market strategy. It was argued that this strategy, while understandably based on sports organizers commercial needs, nonetheless has to comply with trade mark law, which for example, denied protection to marks like WORLD CUP 2006, GERMANY 2006, or WORLD CUP GERMANY for being generic or too descriptive (see e.g. ECJ, Ferrero v FIFA, Case R 1466/2005-1, 2008; and BGH 2009 I ZR 183/07 – WM-Marken). The requirement of distinctiveness is a fundamental criterion in trade mark law and strikes an essential balance between private and public interests. Similar “safety valves” can be found in copyright law, which does not protect ideas; in patent law, which does not protect abstract formulas; and of course in trade mark law, which does not protect words or expressions that are generic or descriptive. The commercial behavior of sports organizers such as FIFA, which usually require the approval of sui generis legislation as a condition for a country to host the finals, often imposes rules that strengthen the proprietary element of trade marks without paying due attention to the public access aspect. It was pointed out that even groups that are generally very supportive of IP rights, such as AIPPI, have questioned the ‘stretching’ of intellectual property to confer extended sui generis rights to sports organizers, as this would tarnish the nature of trade mark law. 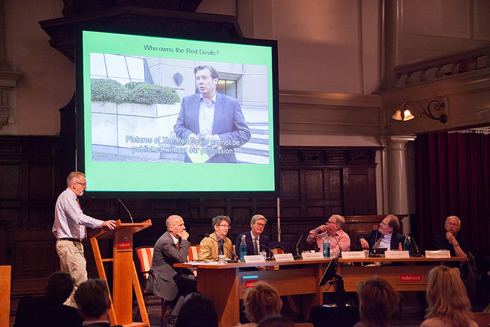 The third intervention, by prof. Dirk Voorhoof, focused on access to information to sporting events and property rights. Access to certain events of particular importance in terms of public and societal relevance is regulated in the Audio Visual and Media Service Directive (AVMSD). The AVMSD establishes that events of major importance for society – as identified by national rules – are to be broadcasted on free-to-air TV (Art. 14), whereas exclusive broadcasters of events of high importance to the public are subject to a right to give access to their signal to other broadcasters for the purpose of news reporting (Art. 15). The case law of the ECJ (such as FIFA and UEFA v. Commission, T-385/07, T-68/08 and T-55/08) and of the ECtHR (e.g: Lillo-Stenberg and Saether v. Norway, ECtHR 16/1/2014) was discussed and the role of sporting events as a type of informational asset to which – under circumstances – the public has a right to access was confirmed. The intervention went on to discuss a fascinating case in which the Belgium football league tried to obtain an injunction against the publisher of a yearbook that featured photos of the Belgium national team, the Red Devils. The excerpt of a Belgium TV news program interviewing a certain renowned professor of law from Gent University, as well as a representative of the Belgium league association was shown (and can be seen in the now available YouTube video of the conference). The short video compares on the one side how important it is for sport organizers to protect every possible aspect of their business, and on the other side how this approach can harm freedom of expression and the public interest. The speaker concluded his intervention underling the need for instruments against abusive claims, injunctions, bans and litigation by sports associations in order to properly protect freedom of information. Another important aspect that the speaker pointed out – and for which the organizers of this ‘men only’ panel discussion apologize– is gender diversity in football and in sport in general, a field still dominated by gender inequality. The next conference on sports rights will certainly be more representative. The fourth intervention, by prof. Alan Bairner, discussed the concept of ownership in football from the unusual – at least for this mostly legal conference – perspective of sport sociology. The value of ownership and the reasons why there is a need to own things such as football or the World Cup were discussed in this cross-disciplinary talk. It was argued that the importance of ownership is connected with the value that can be extracted from it, which is intimately linked to the desirability of the owned object. In the case of the World Cup, a number of agents is largely responsible for creating this value, even if they are not recognized as the “official” owners. The growth over the past 40 years of the World Cup’s economic value is largely due to the parallel growth in fans who want to watch the games, either in the stadia or on TV. From this point of view it could be argued that fans own or should own a share in the World Cup. Imagine for a moment what would happen if fans decided not to watch the next edition at all! Players – not just individually, but also as part of clubs and federations – constitute a second major class of agents connected with the value of the World Cup. Without players (and without the clubs that employ them) there would simply be no World Cup. However, players – and even more so clubs – derive most of their economic value from non-FIFA World Cup competitions, yet they bear the risk of injuries and physical stress associated with playing for the national team. With the increasing commercial growth of sports events in competition with the World Cup in terms of fans interest (e.g: the UEFA Champions League) a tension between the clubs/employers, players/employees, and sports organizers has been reported. While it is hard at this point in time to determine how it will evolve, it was argued that the role of fans will certainly be decisive. The intervention concluded with the observation that FIFA “formally” owns the World Cup, but that fans and players are major stakeholders in making it what it is. There is no legal requirement for fans to attend matches and should they decideto stop, they could easily strip out such ownership from FIFA. Following these four interventions, different in focus but equally thought-provoking, two commentators offered their views. The first comment came from one of the most renowned US intellectual property scholars, prof. Peter Jaszi. The US perspective could of course not focus on football (meaning soccer) since this sport is still struggling to achieve the same fame and enthusiasm that other professional sports undoubtedly possess in North-America. 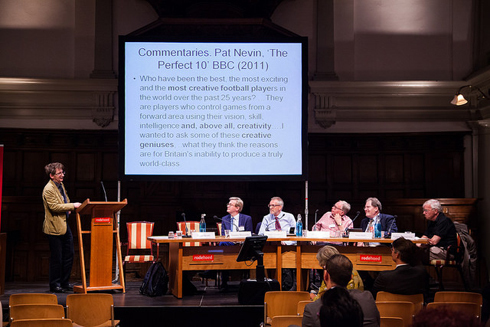 Therefore, The speaker presented a few examples of IP in more “American” sports. . Football (as in American football) provided an interesting case for trade mark law, as the controversial registered trade mark of the Washington professional football team was recently cancelled by a decision of the Trade Mark Appeal Board for being an offensive and disparaging expression. Baseball and the radio broadcast of games – or better, the prohibition of talking in public about what one heard on the radio without the express consent of the Major League Baseball – represented another interesting anecdote. These examples were used for an extensive reflection and historical analysis of the role of IP rights in US sports. Surprisingly, it was shown that the US has done very little to ensure IP protection for sports events over the years. This is certainly unexpected for a culture where sport represents an indicator of success, and where efforts to commodify information through IP rights have proven quite successful in other areas. The underlying reasons are not entirely clear. The notion of common ownership, i.e. that sport is the common property of fans and that it would therefore be socially inappropriate to deprive the public from access, can be seen as a possible reason. Another reason might be the strong freedom-of-expression-oriented legal culture that characterizes the US. Yet another reason might be that most sport gambling is illegal in the US. Nevertheless the lack of dedicated IP protection for sport in the US remains a mystery to be solved. The second commentator, former IViR’s director prof. Egbert Dommering, delivered the final intervention and offered a comprehensive and systematic round-up of the different elements that emerged during the panel. He started by focusing on those elements of sport that are relevant for determining the right type of protection. Firstly, there is the game and the connected property rights in the venue where it is played. Secondly, there are the players and the related informational privacy or publicity rights. Thirdly, there are content producers, who often own rights on the results of their audiovisual recordings, fixations, and broadcasting of the event. Fourthly, the right of the information media companies to access the venue and/or the signal in order to be able to offer to the public an account for informatory purposes. Fifthly, a general right to exploit the event in many different forms (e.g. sponsors, marketing companies, gambling operators, etc. ), which is shaped by a number of ad hoc contracts concluded by the relevant subject. Traditional property rights in particular represent an important, and sometimes underestimated, tool to protect the value of the investment. 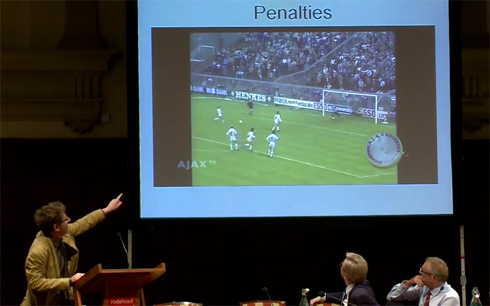 Acts such as fencing the venue where the event takes place, controlling access, and prohibiting specific acts by contract are all examples of the effectiveness of this ’old-school’ but powerful right (a legal construction also known as “house right” in many jurisdictions; this aspect is discussed in the first part of IViR’s sport study). Another important set of rights regards the recording of the event and its broadcast. These acts can trigger various forms of protection such as copyright in the audiovisual work, the producer right in the first fixation of the film, and the right of the broadcasting organizations in their broadcasts. However, one aspect stands out. The exclusive right to record the game relies on the de facto monopoly, not over the game in itself, but over the venue, the stadium, or the circuit where the match is held. Therefore, most of this exclusivity, although backed-up by property rights, is essentially contractual. Is this situation efficient? Is there a need for some sort of “organizational right” (as it exists for example for the organizations of shows and spectacles or for films) that could internalize all the transaction costs that are now addressed by contracts? This last comment concluded the panel and the audience was ushered towards the closing ceremony of what has been a great conference. If you missed it, please do watch the videos of the panels on IViR’s YouTube-channel. Alas without the live experience, but definitely very interesting and definitely very entertaining. You might even figure out what was so controversial about the sport panel that earned it a block!